Wigs / Blog | All about Wigs / 3 Things You Need To Know Before Buying a Wig! New to wigs? Great news! The craftsmanship in wigs is better than ever and so it's pretty easy to get an amazing natural look that is comfortable and completely secure. 1. HAIRSTYLE- Are you willing to take a risk and change up your look? Go completely short or take a long shot! Maybe you want your look closer to your biological hair style. If this is going to be your first wig, we recommend you stick as close to your current style or style you feel most comfortable in. Remember… A wig is a perfect hairstyle. 2. COLOR- The most exciting aspect of wearing wigs is that you don't have to commit to any chemical damage or long term look as you can change colors as often as you change your mind! However, if this is your first wig we do suggest to play it safe and go with the color you are most familiar and comfortable with. (Are you noticing a theme here? ;) Because wigs are always going to look foreign on your head even if it is the best quality money can buy... you will feel like you don't look like you! But you will warm up to perfect hair pretty quickly. This is why we suggest staying with a style and color close to what you already know. But for the more adventurous spirit, go for it... have the hair you have always wanted to try! For the most natural look we always suggest going for a rooted color or a hair color with highlights and depth. This gives a bit more of a natural look and feel over solid colors. Remember, different lighting (outside, inside) will reflect a difference in color so make sure to check your wig in both when deciding your favorite color. 3. LIFESTYLE– your lifestyle, schedule, and ability to style hair should be taken into consideration when buying a wig. How much time do you have to spend or are willing to spend on styling your hair? What climate will you be in? And of course… budget! Someone with little time or ability to style their hair every day may want to consider staying with a synthetic hair wig as they are light weight and already pre-styled. So, no matter the weather, you never lose your style! Of course, there is nothing exactly like human hair wigs. But they do have to be styled each time and are pricey. The answer to these questions will determine whether your best options are synthetic hair or human hair wigs. They are both amazing and have their advantages over the other… But the most important thing is to figure out which works best for you. Style, color, and lifestyle… figure these things out and you can now head in the right direction towards your perfect match! 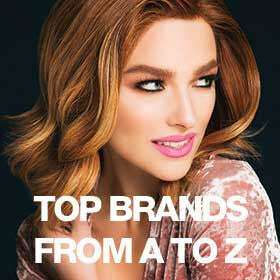 When shopping with us, we suggest you start with choosing the synthetic wigs or human hair wigs category. Then choose the style you were interested in. Once you pick the style you will have lots of color options to choose from. If you need help along the way please see our advice and how to section or call us ... we love to help! Wigs are easy to wear and quite addicting once you realize how convenient they are! Are you new to wigs? What questions do you have? Tell us below and we will answer them! You are correct! There are definitely not enough petite size wigs to choose from. However, there are more being introduced all the time! Ellen Wille just launched the Hair Society Collection which is made from women with severe hair loss as they always need petite size because they have no hair to add to the circumference of the head and need petite! Hair Society Collection wigs, by Ellen Wille, are all petite and will fit perfectly. Most Human hair 100% hand tied are also petite too. Some manufacturers will custom make you a petite size in the styles they carry but there is always a considerable price increase to this service so if you can find one already made… you are in business! I hope this helps! If you have any other questions, please give us a call at 800-581-2001 and one of our Wig Experts would be happy to find the perfect petite style for you! Marlo, thank you so much for your question! There is a short overview video and 5 more in depth ones for you to choose from to get a solid understanding of how the colors are put together. I hope this helps you get a better picture of color!…And don’t feel discouraged, it is the most challenging thing about choosing a wig online… but once you get it down, the rest is super convenient! If you have any other questions, give us a call at 800-581-2001 and one of our Wig Experts will assist you with finding the perfect color! I would be a great consumer of many wigs. . I have a specific taste in wigs. Very few like maybe 1% of them are offered in small sizing. The average is akwsys to big. Is it possible to request a wig in a small size that says only regular? Thank you for comment on our blog! Great News! We offer International shipping which takes about 8–14 business days for $54.95 US Dollars. However, we are not responsible for any duties, taxes, or additional charges that may be charged by Customs for any International deliveries. Note: Ellen Wille items may only be shipped within US & Canada; International shipping not available. We have few styles that we think you might like! Our Wigs offer amazing features that look and feel natural! Of course, different cap constructions each have a different method of attaching hair to the cap, and each has its own set of advantages. We will email you a link with our favorite short styles! As always, feel free to give us a call at 800-581-2001 M-F 8:00 AM to 6:30 PM. are you shipping wigs in EU? Wow lots of questions, we’re happy to help! Lace front creates the illusion of a natural-looking front hairline while a monofilament creates the illusion of natural hair growth from the scalp where the hair is parted. Rooted colors are beautiful, they create a more natural look. For further information, check out https://www.wigs.com/pages/wig-buyers-guide or feel free to give us a call at 800-581-2001 M-F 8:00AM- 6:30PM CST. Lace front? Rooted? What is the difference? And the caps? What is what and what do they mean? I’ve considered wearing wigs for a while and am very interested. I figure synthetic and pre-styled will be my best bet, for now. Low fuss, low muss. But I don’t know anything at all about wigs. How to wear them, how to choose them, how to take care of them… Help?